Converted from a typical and ancient country house, inside an old farm, "Casa Vacanze Vigna Maria" is located in the western part of the Island of Elba, in one of the most characteristic, uncontaminated and genuine areas of the Island : on the edge of the Tuscan Archipelago National Park, in a hilly area above Sant'Andrea, overlooking a lush valley that extends to the sea below from which you can enjoy beautiful sunsets and the view of the islands of Corsica and Capraia. The structure takes its name from Mrs. Maria, matriarch of the family who runs it and still responsible for the warm welcome, to the customers, as well as the historic vineyard that stretches to the valley. The valley is still managed and cultivated by the property with the typical Elba crops, strictly in a biological way, which the customers can stock up on daily: wine, fruit, citrus and vegetables of various kinds, including the famous and equally rare "Cipolla della Zanca", Slow Food presidium. Our Holiday Home has completely renovated and independent apartments that have a capacity of 2 to 5 beds. They are furnished and equipped with one or two bedrooms, bathroom with shower, kitchen TV and WIFI Some apartments also have a private terrace, but all still offer a beautiful view of the valley below, the sea and the legendary sunset, enjoyable also from the Solarium where there are sunbeds and reading armchairs available to all customers. The structure has a private car / motorbike parking available for guests. Weekly stays are preferred for stays. Prices vary depending on the period and capacity and range from a daily minimum of 50 euros to a maximum of 150 euros per apartment. 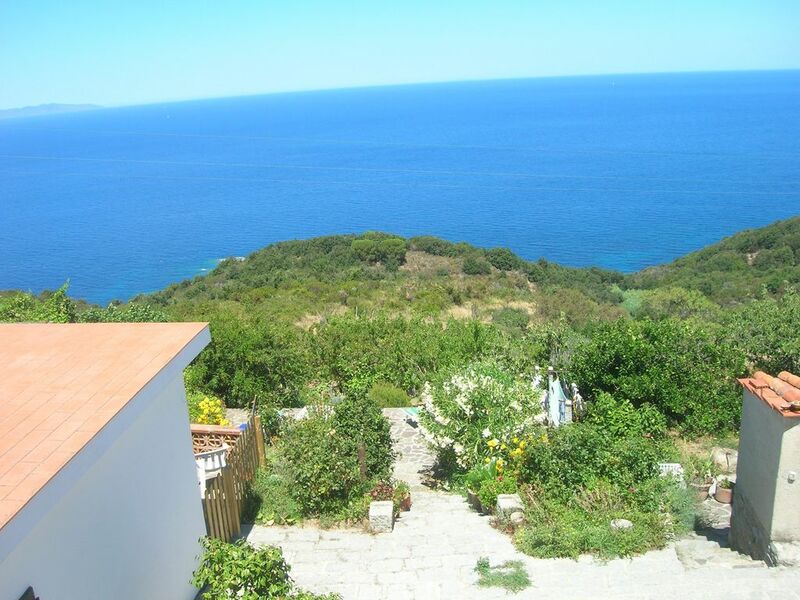 From the house it is possible to take walks with direct paths up to the suggestive cliffs below, overlooking the "Scogli delle Formiche" and the Capraia Island, where you can enjoy a pristine sea, in complete tranquility away from the typical tourist flows. In the nearest beach of Sant'Andrea (1 km), moreover, you can take advantage of a bathing establishment, diving or boat rental, while guided tours of trekking and mountain biking are organized in the area. It is otherwise possible, in a few minutes by car, to reach any beach of the famous "Costa del Sole" (Patresi, Chiessi, Pomonte, Seccheto, Fetovaia, Cavoli). Beim nächsten mal buchen wir eines der unteren Häuser.